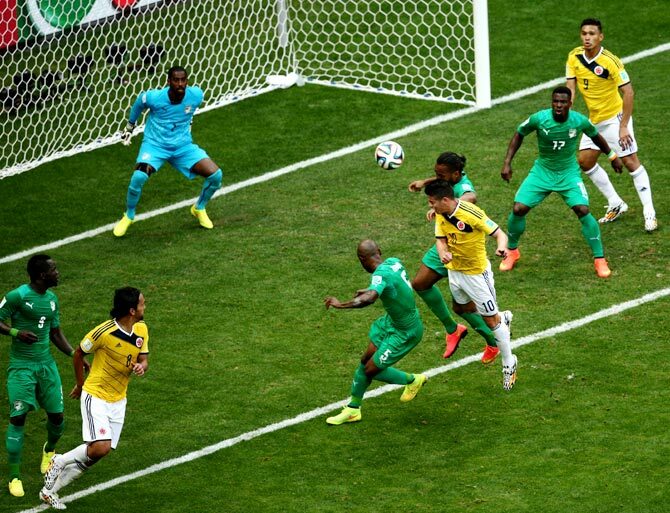 A terrible defensive lapse cost Ivory Coast dear as Colombia defeated them 2-1 in a gripping World Cup group match which saw three goals being scored in the space of just nine minutes in Brasilia, on Thursday. The young generation of the South American side took the centrestage with 22-year-old Rodriguez and 21-year-old Quintero scoring a goal each in front a partisan Colombian crowd at the Estadio Nacional. Colombia, who had thrashed Greece 3-0 in their opening match, are now on the verge of a berth in the knockout round as they now topped the group with six points with one match remaining -- against Japan on June 24. The South Americans, who are returning to the World Cup finals stage after a gap of 16 years, had reached the round of 16 at the 1990 World Cup in Italy. 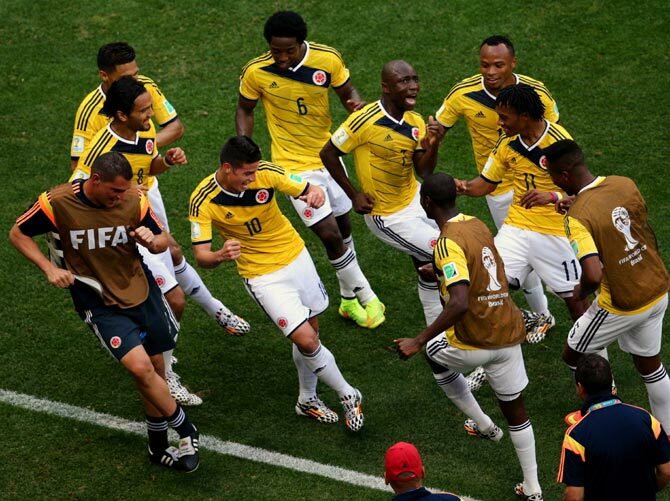 Image: Colombia's players celebrate after James Rodriguez (No.10) scored the opening goal against Ivory Coast. In the first half, Colombia struggled to unleash the free-flowing style of football they displayed in their 3-0 thrashing of Greece. Ivory Coast looked a better side with captain Yaya Toure controlling the midfield in the first 45 minutes. The first half's best chance came in the way of Colombia in the 28th minute but striker Teofilo Gutierrez spurned the easiest of a chance. James Rodriguez's cross fell perfectly for Gutierrez just outside the six-yard box, but he miscued his volley and it skewed wide. That was the only clear-cut chance of a cagey first half. The Ivorians only threatened with long-range efforts by Cheikh Tiote and Serge Aurier. Tiote made a left-footed strike from at least 30 yards but sailed well over the crossbar in the 27th minute. Aurier got a good look on goal after beating Mario Yepes on the dribble and forced Colombia goalkeeper David Ospina to make a good save in the 31st minute. 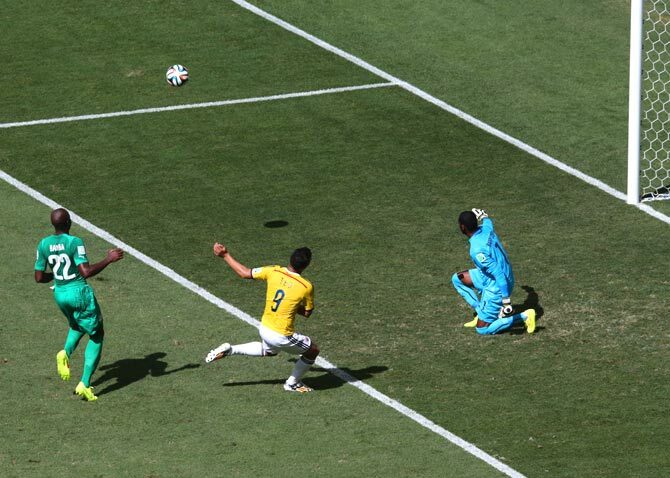 Image: Teofilo Gutierrez of Colombia (centre) misses a chance to score in the first half. But, it all changed in the second half with both sides unleashing a series of chances one after another. In the 59th minute, Juan Guillermo Cuadrado makes another dazzling run into the box, beating a few Ivory Coast defenders but his shot glanced off the bar. Colombia took the lead in the 64th minute when James Rodriguez rose above the rest to head home a Cuadrado corner kick to the wild celebration of his country's supporters. Substitute Juan Quintero, who replaced Victor Ibarbo in the 53rd minute, doubled the lead by capitalising on a defensive lapse. Serey Die unnecessary cut the ball back on the path of Quintero who burst past him and made a perfect placement to the right of Ivory Coast goalie Boubacar Barry and into the open net. Gervinho reduced the margin in the 70th minute with a superb solo effort as he dodged past three defender to shoot home from an angle. 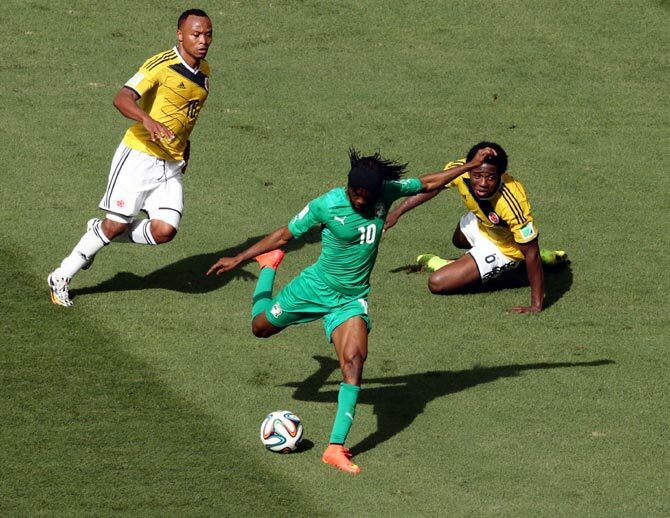 Ivory Coast, who play Greece in their final group match on June 24, made a frenetic effort to get an equaliser in the final minutes but the Colombia defence led by captain Mario Yepes were up to the task.